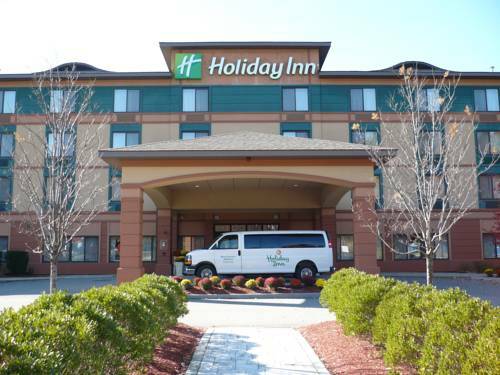 Welcome to the Holiday Inn Manchester Airport, the most convenient full service hotel in Manchester New Hampshire! Located near Manchester Boston Regional Airport, this Manchester, NH hotel, features a complimentary airport shuttle. Many prefer the Holiday Inn Manchester Airport for its convenient location to the area's leading corporations such as F.W. Webb, Electronics for Imaging, Siemens, Southern New Hampshire University, and some of the area's finest hospitals, including Catholic Medical Center, and Elliot Hospital. Our hotel is minutes from the Currier Museum of Art, Southern New Hampshire University Arena, home of the Manchester Monarchs, and Delta Dental Stadium, home of the New Hampshire Fisher Cats. Shop at the nearby Mall of New Hampshire and Merrimack Premium Outlets where shopping is always tax free! During your stay, take advantage of all the wonderful hotel amenities. Stop by The Common Man Airport Diner, where kids always eat free! Unwind in our lounge, erase the day's stress in the fitness center, Jacuzzi or take a swim in our heated indoor pool! With services like these, it's no wonder why the Holiday Inn Manchester Airport is a favorite in New England! The Common Man's Airport Diner: Go back in time to the 1950s in our Airport Diner which features a great menu with a number of diner classics! Our hotel restaurant and lounge is open from 5am to midnight and serves breakfast, lunch and dinner and the best part is...kids eat free! Airport Diner: Stop by the Airport Diner for a tasty drink and light fare during your stay at our hotel in Manchester, NH. Childrens's program - Heated Indoor Pool. Amoskeag Room: The Amoskeag Room offers 625 square feet of flexible function space and is perfect for a small training or baby shower! Derryfield Country ClubDerryfield Country Club is an eighteen-hole public golf course located in the heart of Manchester, NH. At Derryfield Country Club, you will find the Derryfield Golf Shop, a fully stocked golf shop, as well as the Derryfield Restaurant & Lounge. Manchester-Boston Regional Airport - NHThe convenient alternative to Boston's Logan Airport. Manchester-Boston Regional Airport is served by: Air Canada, Continental/Continental Express, Delta/Delta Connection, Southwest Airlines, United/United Express, US Airways/US Airways Express. Southern New Hampshire University ArenaFormerly the Verizon Wireless Arena, Home to the Manchester Monarchs and a number of other events throughout the year. Southern NH University - Manchester, NHSouthern NH University is a private university on a 300 acre campus that features excellent educational programs. Northeast Delta Dental Stadium, home of Fisher CatThere isn't a better way to spend a Summer Evening than the excitement of a Minor League Fisher Cats Baseball Game, great entertainment at affordable prices! Mall of New Hampshire - Manchester, NHThe Mall features Macy's, JCPenney, Sears, and Best Buy. The mall also offers 125 specialty stores, 4 full-service restaurants, and a Food Court. Currier Museum of Art - Manchester, NHInternationally renowned art museum located in Manchester, NH. Palace TheatreNew Hampshire venue offering a variety of productions throughout the year. Catholic Medical CenterMulti Specialty Community Group practice w over 100 physicians and providers. Canobie Lake Amusement Park - Salem, NHOpen April through September featuring over 85 rides, games, live entertainment and attractions! McIntyre Ski AreaSkiing, Snowboarding, Tubing & More! New Hampshire Motor SpeedwayNew Hampshire Motor Speedway hosts two Nascar Races each year and has added on the IZOD IndyCar Race for 2011! Anheuser Busch Brewery TourQUALITY is at the heart of how Anheuser - Busch has conducted business since the company was founded in 1852. You can experience that quality during one of our complimentary tours. Millyard MuseumSkiing, Snowboarding and Tubing for the whole family right in the heart of Manchester, NH!